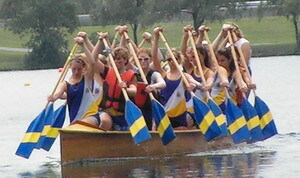 A Dragon Boat racing club providing paddlers with unique opportunities that ANYONE is welcome to join. We have both coached teams and collective teams that gather together for race day only. It's all about having fun, with a little adrenaline rush on the side! See www.RustyDragons.ca. I will be putting lots of details in these BLOG entries, including names of people, places, and events. As a result, they should ultimately be a great SEARCHABLE database of info. Feel free to suggest topics. Registration of teams practicing this summer at the Balmy Beach Canoe Club is underway for their two dragons boats. Time slots are available 7 days a week at very reasonable rental rates. Included in team booking packages are use of the facilities, life jackets, paddles, and paddler insurance. See their dragon boat program page at http://www.balmybeachcanoe.com/Programs/dragonboatrentals.aspx or contact me for details at Tim@DDRA.ca. Sara Jones is leading another season of a high school program at Balmy Beach. The students practice twice a week for 2-hours each practice (using two boats) in the month of May as they prepare for the Pickering Youth (High School) Dragon Boat Championships. See the Pickering festival website at http://www.pdbc.ca/festival/youthchampionships.html. This enthusiastic group of paddlers have expanded to two boats this year! Their team co-captains are Carmen, Kevin, and Massey and they are working out the program and regattas. They practice Tuesdays, Fridays, and Sundays and their website is: http://www.utsc.utoronto.ca/~dboat/. The U of T University College team captains are Albina Tyker and Fransciso Woo, and they are planning out a similar practice schedule to last year. Their website is http://www.ucwaterdragons.org/. This team is still working out their schedule. Their captain Anna Homem is looking forward to another exciting season for the all-women's team. The 8th season of the parents and kids racing crew is raring to go. They won the "B" Division of the 10th annual DDRA Canada Day Regatta beating out other adult teams by a boat length and we had 9-12 year old paddler on the boat plus their parents. The team was formed back in 2006 by Tim MacFarlane who has coached them ever since. See http://rustydragons.homestead.com/2013/2013KrakenKrew.html for more details. Toronto Regional Office "Tough on the Water"
These two teams are running similar programs to last year and announcements will be made shortly. Contact Tim@DDRA.ca if your team is interested in booking practices at the site. I am really looking forward to going to Dragon Boat Canada's 2013 Canadian Dragon Boat EXPO on the weekend of March 2-3 in Montreal (Canal Fitness - 5524 rue St-Patrick, #150). Registration is via Dragon Boat Canada's website at http://www.dragonboat.ca/. The schedule for the two-day event is also available via this site. I have gone to the last two EXPO's in Toronto as a great opportunity for networking with other coaches, athletes, and event planners. There are many very useful sessions at the conference that are run by top Canadian coaches, medical and nutrition experts, event planners, etc. There are also pool paddling sessions, although to be honest I skip those as I want to maximize time networking at this unique event. The event will also include the 2013 Canadian Indoor Dragon Boat Championships at 5-7pm Saturday night. There will be at least 7 Pickering Dragon Boat Club athletes and coaches in attendance, including Scott Murray, Andrew Milner, Suzanne Hennig, Jordan Morgan, Patrick Kelly, Tim MacFarlane (me), and Kevin Gale. Special guests at the event will be Olympian Olympian Elise Marcotte on Saturday and former Montreal Canadian RW Chris Nilan (my FAV team) on Sunday. In addition to attending the two-days of sessions, I will also be setting up a simple information table there promoting the DDRA Canada Day Regatta (we'd love to have a Montreal area teams come) as well as promoting the concept of kids in dragon boats (including details on my 8th year parents and kids team). Fellow PDBC athlete Kevin Gale will also have a table there for his line of Immunotec health products. See his website at http://www.immunotec.com/galefire for details, and contact Kevin if you are interested in any of his products, especially the Immunocal product that boosts your immune system and improves muscle repair with a natural product that boosts your body's production of glutothione. It's great for athletes! I am car-pooling so if anyone wants to go then please give me a shout, even if it is just to visit good 'ol Montreal! I will likely be leaving Toronto Friday morning and returning Sunday night. The Pickering Dragon Boat Club (PDBC) held an important general meeting tonight for all athletes and coaches to talk about the upcoming season. The meeting was centered on the Senior A (Masters), Senior B (Grand Masters), and Senior C (Grand Dragon) teams. June 1, 2013, a "Senior B" paddler must be 49 by June 1, 2013, and a "Senior C" paddler must be 59 by June 1, 2013. There is no question that the goal is to win GOLD at the 2013 Canadian National Dragon Boat Championships on August 23-25 at Elk Lake, Victoria, BC. There we will make a statement to all other teams in Canada, and earn our right to represent Canada as a club at the the 9th Club Crew World Championships in Ravena, Italy on September 4-7, 2014. Last year the PDBC Masters team (40+) was a top 20 team in Canada (of any team of any age), and this year we plan to rise higher up the ranking. Other regattas we are competing at this summer are the Pickering Regatta (June 1), Toronto International Dragon Boat Race Festival (June 22-23), GWN Sport Regatta (July 20), and the Quinte Sprints (August 17). > Stan Walton from Walton Sports (http://www.waltonsports.net) who brought PDBC apparel for sizing and sale. Walton Sports is the official supplier for Dragon Boat Canada as well. > Sarah Moore from Durham Travel (http://www.durhamtravel.ca) who will continue to help us with our national and international travel planning. > Kevin Gale from Immunotec Research (http://www.immunotec.com/galefire) who brought some of his health product line and information. Check his site out for details on his Immunocal product that contains the richest source of glutathione building blocks available. Read about it on his site. As February arrives, I am very happy to accept a new position with the Balmy Beach Canoe Club (BBCC) as their new Dragon Boat Coordinator. This position was previously held by Heather Smith who made a big impact last year with her re-organization of the dragon boat registration and support process. Heather has a young son at home and also lives in Burloak area that is far west from BBCC. She decided to step back a little and focus on her growing family and her teaching job. I very much wish her all the best, and I hope she is able to squeeze some paddling into her schedule in the area closer to home. As I worked with Heather last year for my Rusty Dragons teams and other teams I supported, I can't say enough good things about what Heather did for both us and BBCC. This year signals a change in direction at BBCC. They have decided to begin developing their own dragon boat programs and work on a new model for the use of the site by all sports. I am very happy that I have been entrusted to be part of the team that will work on that restructuring and development work. BBCC will have two of their own boats at their facility for the first time. The OPS Dragon Boat Club who previously had their boat there will be moving their boat to another location in April. I had brought the OPS boat to BBCC and drafted a mutually beneficial MOU 6 years ago after we had to leave Outer Harbour (when GWN left that site). BBCC certainly thanks the OPS DBC for their years of support and use of the site. There are many great people at BBCC, which is why I have enjoyed working there at the site, and working with the Dominion Day Regatta Association (DDRA) for whom many members are from BBCC. Their Commodore is Anne Buckley, Treasurer is Gaynor Reader, Rear Commodore Dave Moore, head coach Peter Martinek, high school program coordinator Sara Jones, past Commodore Rob Cook, Master's Coordinator Shannon Doyle, and many others I have been fortunate to know. I am very excited to start working more closely with BBCC. Last year I also signed up for Masters program where I got my first taste of sprint kayak (I raced in a K2 on Canada Day), and war canoe. I have a new appreciation for the skill and balance needed for these sports (and I already knew it was difficult). I am sure there will be more for me here! I am also looking for opportunities to introduce others in dragon boat world to these sports through arrangement of try-outs for those interested. Kids are especially welcome to join the BBCC and learn to paddle sprint canoe, kayak, war canoe, or dragon boats. See their website at http://www.balmybeachcanoe.com/ for more information as well as contact details. For dragon boat information, you can contact me at Tim@RustyDragons.ca.